The Search For Jacky Frost Has Ended! The lyrics to this song were adapted from the poem, "Jacky Frost", by Laura E. Richards. You can find this poem in the collection "Tirra Lirra Rhymes Old and New" by Laura E. Richards. Thanks to Dianne of ATL Books for providing the information about Laura E. Richards. This invaluable clue helped me to track down the music. The music was composed by Eleanor Smith, who included the song in her music textbooks designed for children. These textbooks are over 100 years old. You can find the song in "The Common School Book of Vocal Music" by Eleanor Smith. She adapted the poem just slightly to fit her melody. 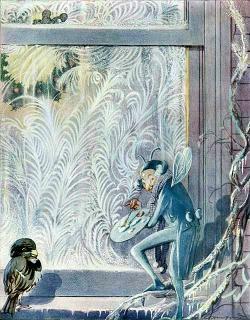 Illustration: "Jack Frost" by Oliver Herford. Used with permission. Courtesy American Art Archives. And pinched her little nose. Coming Soon: A MIDI file to listen to the melody, and download. If you want to see a printed version of the music as published, you can click on this link. and select "Save Target As.." or "Save Link Target As.." (or comparable selection depending on your browser).